After a long stint as an arcade-only release, Dissidia Final Fantasy NT has finally made its way on to PS4 – and to the west. Featuring a cast of nearly 30 playable characters, there are plenty of playstyles for you to choose from. Does the game hold up as a solid fighter, or should you just stay far away? Dissidia Final Fantasy NT is the latest title in the series of fighting games based on the Final Fantasy series. Making a large leap from PSP to PS4, as one can imagine everything is being done in a much larger scale than before. This isn’t limited to just the arenas either – the battles are now on a much larger scale, with the combat being in a 3 vs 3 style. This change is both good and bad, as the battles end up being far more hectic than before. Once you learn how to keep up with it – or at least try to keep up – you’ll need to hope that your teammates are up to snuff so that you don’t just get completely trounced on by your opponents. While not for everyone, the 3 vs 3 style does take quite a bit of getting used to. Then, of course, there’s the fact you have to deal with a lot of lag. 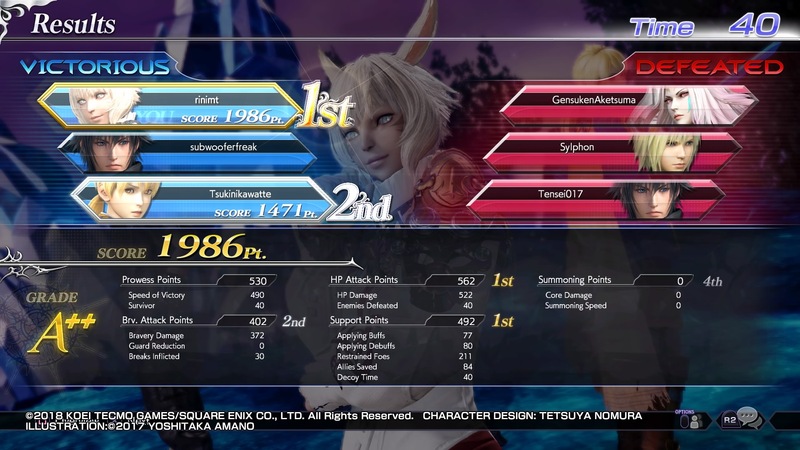 Dissidia NT doesn’t have dedicated servers, and instead opts for the peer-to-peer style. This means that should any one person (of six!) have a connection issue, the entire match stutters and freezes constantly. You have to hope you can play through it, which is easier said than done for some characters. There also seems to be some balancing issues. Now, I’m not claiming to be an expert at fighting games – in fact, I’m pretty much a novice at them. 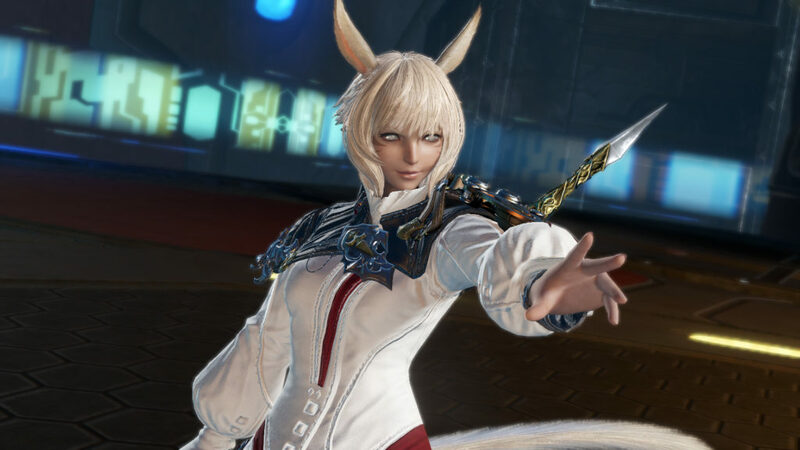 But I found myself struggling with my main character from the first two games – Onion Knight – but absolutely killing it with newcomer Y’shtola. Playing matches as her I just felt completely in control of the match, and her first HP Attack – Holy – just felt so incredibly strong. During a fight, you will find that you only have three lives – or stocks – available to your team. The team that depletes the other team’s lives first is the winner, unless you time out in which case it becomes a draw. Should you position it right – or simply just get lucky – you can even take out multiple opponents at once with a single HP attack! As an addition to the PS4 version over the Arcade version, the PS4 version also features a “story” mode. You progress in this story mode by leveling up your player level, with each level granting you one “Memoria”. Each Memoria is used to unlock a node on the map, and the map features a large number of cutscenes along with some battles. Now, if you played the PSP games you might be thinking of a large map that you can wander around in, but no. In NT, the map is a web of nodes that contain the story. The biggest fights you will face during the story mode matches are the summon battles. In these fights, it’s you, along with two AI characters, versus a single giant enemy, the summon. These battles are either incredibly easy or hard depending on what characters you have available and how good you are at these particular characters. It would have been nice if there was a bit more balance between these fights. 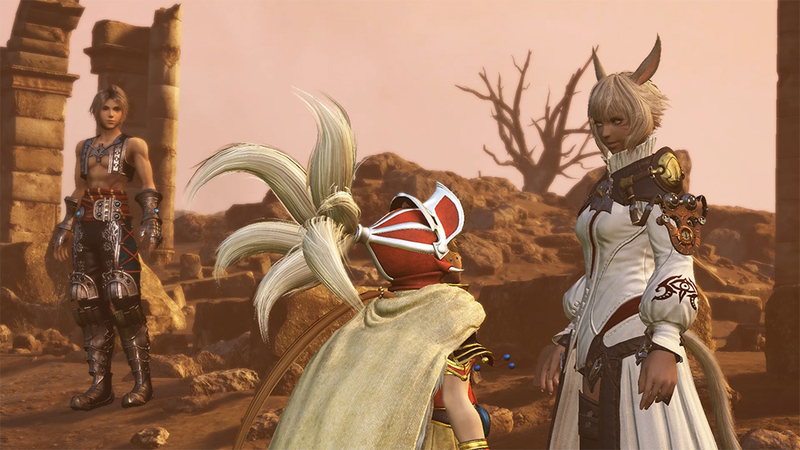 Most of the music in the game is returning from the prior Dissidia’s, although new arrangements are present for the new games – XIV, XV, Type-0, and Tactics. I do wish that you could have a custom playlist of music playing in the lobbies though, as the music that plays there gets really old when you get stuck in a lobby for 4-5 minutes. The voice quality is also pretty good with a few exceptions – particularly the lack of voices in some spots. The summons have no voices, just a few grunts, despite having lines that they “say”. There’s also the fact that when you select a character for play in the online mode, their model that appears acts like they should be saying something even though it’s complete silence. Why were these instances left out? I have no idea. One of the other biggest issues in the game has to do with the move list. Every character has different Bravery attack sets depending on what they’re doing, but there is absolutely no way to view them in the game. Without having to resort to outside sources, you’re left with simply doing trial and error to try and figure out how the character acts in various situations. Even then it can be incredibly simple to overlook something, since, for example, there is nothing in-game that states how you Paradigm Shift when playing as Lightning (Tip: Press L3). There is also no way to look up, in-game, information on what each character’s unique Ex Skill does, and that also turns into a trial and error game. Dissidia Final Fantasy NT set out to do big things and to try and really bring Dissidia to the fighting game scene. Instead of doing that it became a big, clunky mess that is hard to follow for an outsider. Along with all the other issues – missing move lists, missing voices, the lag, and the long queue/lobby times – the game is going to find it very hard to keep a good community going. I do hope that some of these issues can be addressed in future patches though, particularly the extreme lag during some matches. As it stands now though, I’m having a hard time to find any reason to recommend buying this, especially at full price. So for now, unless you’re an absolute die-hard fan, stay away from the summoner! I mean stay away from Dissidia Final Fantasy NT until it gets some serious updates to fix the issues within. I was provided with a review code by Square Enix for the purposes of this review. As per our updates, and to stay consistent with our sister site The Backlog, we will no longer be publishing review scores on reviews.